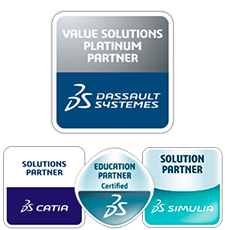 Last November 15th we held our XXI SIMULIA users’ meeting: 21 years getting together with our customers and collaborators to see how things evolve, what is new and how simulation software is helping innovation, initially in the world of design and now also in manufacturing. Year after year we convene speakers who help us see the orientation of the various innovation environments and who, like Édouard Lété, Director of Technical Sales at Simulia, are key players in the sector. Leo Marzal explained how they already use simulation for process optimisation at Mann+Hummel , although the key contribution at present is still in product development, as “residual strains are very important”. To illustrate the application in the initial design phases he used a practical example, namely fatigue prediction in elastomeric materials. The parallel technical sessions were exhilarating. From fluid-structure interaction models to assess ship coatings inspired in shark scales, one of the fastest ocean swimmers, to the use of Abaqus in combination with FlowVision to analyse a beating human heart. Francisco Riera, from Principia, presented the 3DEXPERIENCE platform and the advantages of working with a “dashboard” conveying all the information in real time. This entails a major change in the way projects are handled, promoting collaborative work with the participation of all levels of users. 3DEXPERIENCE optimises the use of time, and hence customer service and cost reduction. Agustín Chiminelli, an expert from the ITAINNOVA materials and components division, made a presentation dealing with simulation as the key ingredient in product and process development. In the afternoon sessions, the presentations described fluid simulations using Lattice-Boltzmann techniques, which free the analysis from the constraints imposed by a traditional mesh, and how the generative functional design in CATIA V6 implies a complete paradigm change. Lastly, Javier Rodríguez, Technical Director at Principia, explained the features that Abaqus proposes for 2018, while Alejandro Soler completed the scope of simulation using the traditional SIMULIA tools. Briefly, we can only express our gratitude to the presenters and the audience for their collaboration to make simulation an ever more important discipline in the future of all industrial sectors. Special thanks to Leopoldo Marzal (Mann+Hummel Ibérica), Agustín Chiminelli (ITAINNOVA), Édouard Lété (Simulia), Joao Costa (CST), David M. Holman (Simulia), Miguel Herráez (IMDEA), Olben Falcó (IMDEA), Jesús Pernas-Sánchez (Universidad Carlos III de Madrid), Alvaro Arconada (SOLUTE), Oswaldo Trigo (ITAINNOVA), Ignacio González (Universidad Politécnica de Cartagena), Alvaro Rodríguez (Universidad Politécnica de Madrid), Deniz Ozturk (CapVidia NV), Joanna Eterovich (Key to Metals AG) and Oscar Puente (Dassault Systèmes) for sharing their knowledge and experience.